Varmints: First, a rant. Then, a solution. Disappointment. 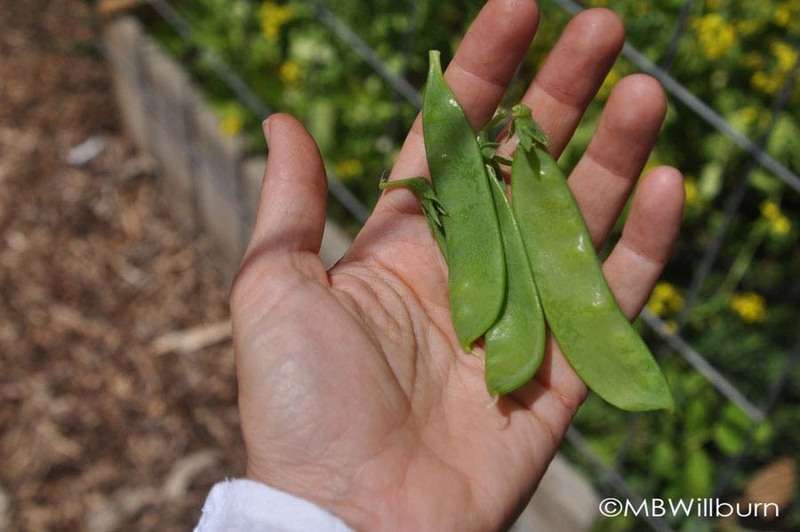 8 feet of peas = 4 peas. It was, in many ways, inevitable. If you build it, they will come, if you plant it, they will eat. Friends have bemoaned the loss of salad beds and snap pea trellises to unnamed creatures and I have cried with them (insofar as I am genuinely sorry but my stir fry will not suffer); but to be faced with one’s own loss, coffee mug in hand, useless Jack Russell by one’s side, morning NPR sweetly crooning a bit of Baroque calm when it should be belting out Wagnerian strains of “Kill the Wabbit…” that…that is a different matter altogether. A frantic scramble for netting. How much do we have? How wide is it – what exactly are we dealing with here anyway? Signs point to groundhogs, but then I’ve always blamed them for everything and there is no money for a wall. 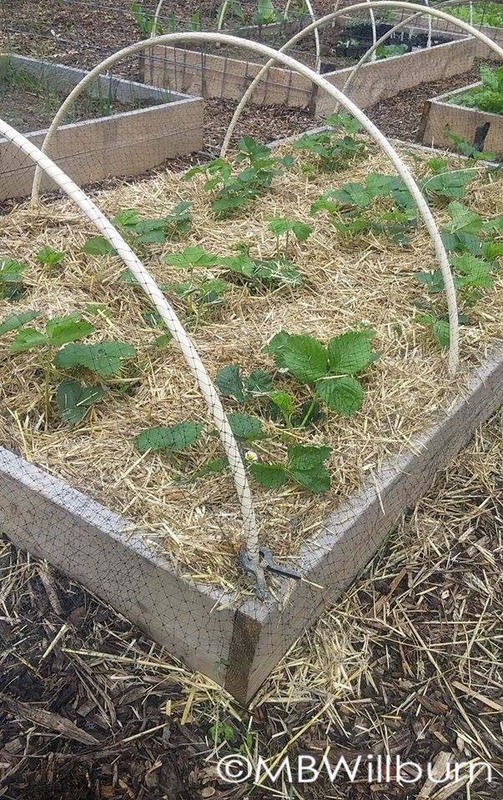 The strawberry bed was netted early in the season against birds. Sadly, I dragged my feet netting most of the other beds. Rabbits? Possibly. Though never spotted on the property, I’ve seen them on the lane – hungry little beggars slinking in and out of hedgerows. They have always given us a wide berth, aware of our reputation as foodies, and fearing that a bit of thievery might end badly – flayed, trussed and roasted on a wilted bed of the very greens that tempted them. Deer? Another despicable adversary, but flattened rows of peas point to creatures far closer to the ground. Deer don’t tend to level rows with greedy, low slung bellies, nor do they ignore taller morsels like rose and peony buds just inches away. So we are back to groundhogs. Just invoking the name and thinking about my ravaged cabbages makes me long for a medieval temperament and a crow bar. They will ruin everything before they are done. I’ve seen it before, and refuse to think of them as delightful additions to the country garden. None of this “welcome the wildlife” rubbish, or “a-third-for-them-and-two-thirds-for-me.” They supersize their meals, return for the rest and happily beget further generations under the protection of your shed’s crumbling foundation. And in doing so, they steal a gardener’s heart. How else to describe the feeling that washes over you as you stand in front of those pillaged beds, measuring hours of work and hope against the reality of a diminished harvest? It would take a better man than I to smile sweetly and rejoice in the circle of life playing out in the strawberry bed. Or perhaps just an urbanized man who’s never grown so much as a head of lettuce between Starbucks top-ups. PVC footings can be used or left alone for the season, depending on need. A bag of hardware store clamps ($8) are terrific clips to have on hand and can always be used elsewhere in the home or garden. My ravings however, are academic. And indulgent. The enemy has breached the gate and must be dealt with. 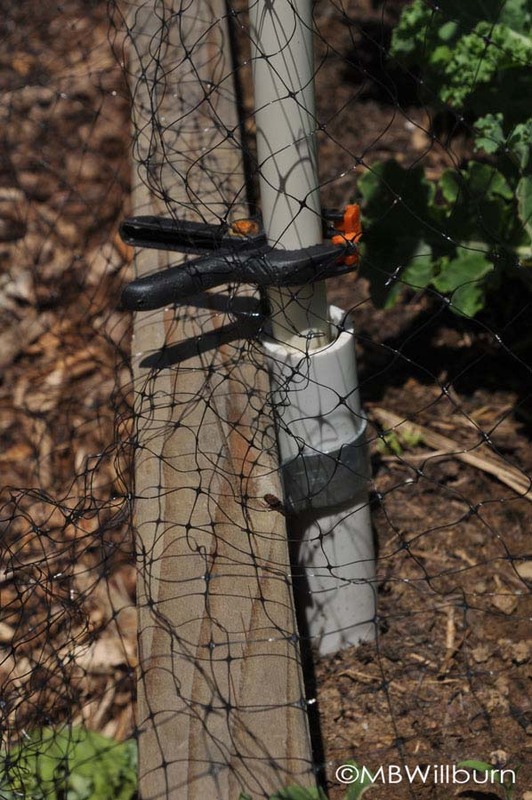 I choose to use netting held by PVC hoops installed on the existing raised beds. With any solution, there must be an element of convenience – otherwise you just won’t use it. That’s why PVC and raised beds work for me. The only real work is in the initial setting of footings. I use rigid ¾ inch PVC cut into foot long sections. Those are pounded in (four to a side) along the inside of the 4×8’ raised bed and fastened with a metal pipe bracket and two screws. These provide permanent footings for installing hoops when and if they are needed. d) You don’t need to keep the hoops up if they are not needed. Yes you can do the same thing on the ground, relying on clay soil to ballast the PVC, but wrestling with weeds growing up through the perimeter of the netting is worse than losing the vegetables in the first place. To protect tomatoes, whose cages are taller than hoops, I use the cages as a structure themselves. This isn’t going to work for your ornamentals, in that the purpose of ornamentals is to be ornamental and there is nothing less ornamental than a bed of ornamentals covered in non-ornamental netting. Large, scrumptious, bud-heavy gardens call for better fencing in general. 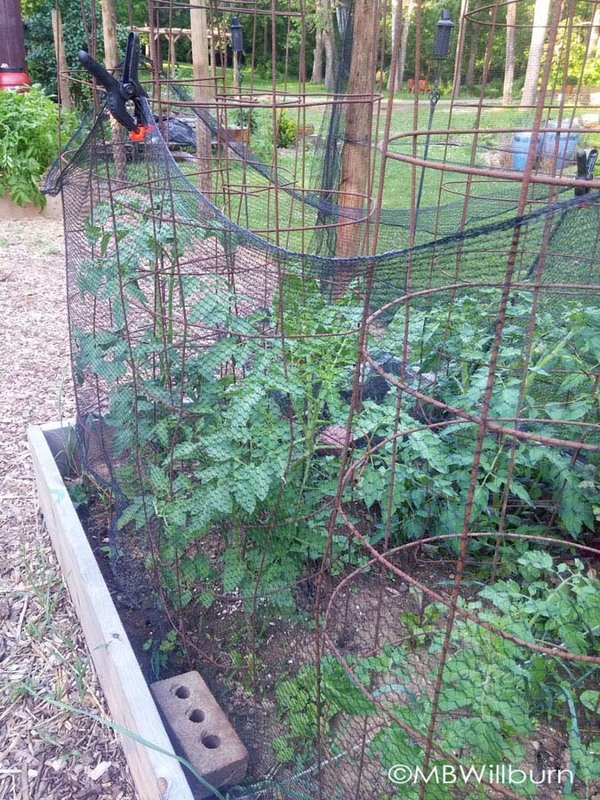 Nor will it work for taller vegetables like tomatoes, however the cages themselves provide an excellent structure for netting – and you can always hoop half your bed and tomato cage the other half if you have mixed beds. It’s flexible, that’s what I love about it. Sadly, there will be no peas for my pot this season, but with the installation of hoops, I may yet save the rest of the Romaine. Things certainly could be worse. It could be two hundred years ago and no Wegmans to fill nourishment gaps with bagged Asian vegetable medleys. Perspective is everything in a gardener’s life. Reprinted with permission from The Frederick News Post.